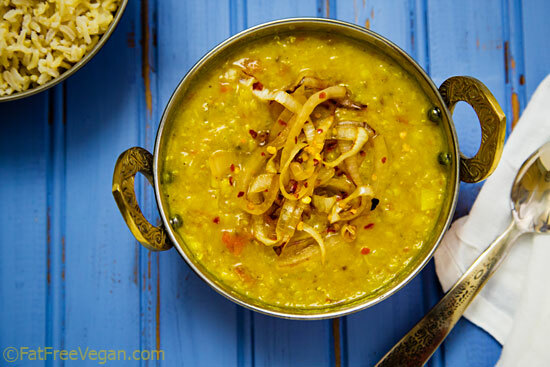 Creamy red and yellow lentils are delicately seasoned and topped with browned onions and hot chile pepper in this fat-free version of the classic Indian dish. Dal Tadka is the dish that made my daughter love Indian food. Years ago, E resisted every time her father and I wanted to go to our favorite Indian restaurant. She wasn’t a big fan of our usual favorites–Baingan Bhurtha, Channa Masala, Aloo Gobi–but once she tried the Dal, she was hooked. That restaurant is now one of her favorites. The only problem with restaurant Dal Tadka is the oil (or, possibly, ghee). The word tadka or tarka means tempering whole spices, such as mustard and cumin seeds, by frying them in oil to release their flavors. That flavored oil is then poured on top of the dish, the dal (lentils), in this case. So you can see the problem for a no-added-oil diet. In the past I’ve tried cooking the whole spices in just a touch of oil (1/8 teaspoon in this Masoor Dal) but I’ve always wanted to find a truly fat-free way to get that restaurant dal flavor. This time, instead of frying the spices in oil, I just cooked them along with the lentils in my Instant Pot and then added browned onions and red pepper to the top. The result isn’t as decadent as the restaurant version, but we found it just as delicious. I served the dal over brown basmati rice along with a new version of Okra Masala, which I will post soon, as well as E’s other favorite Indian dish, vegetable samosas. Unfortunately, the samosas came from the local Indian grocery and were, I’m afraid, fried, but if you’re looking for a healthy substitute, check out my fat-free samosa wraps. All of the heat is in the onion topping, so if you’d like your dal spicier, add as much red pepper as you like while the lentils are cooking. Put the lentils, water, and next 7 ingredients (through salt) into a pressure cooker and lock the lid. (See Notes below for regular stovetop cooking.) Cook at high pressure for 10 minutes (on the Instant Pot, select manual and change the time to 10 minutes). Allow pressure to drop naturally for 10 minutes and then do a quick-release. Open lid carefully and check to make sure lentils are tender. If not, continue to cook without pressure until lentils are fully cooked. Add garam masala and stir vigorously to make the lentils creamy. It should be a medium consistency, so add a little water if it’s too thick. Keep warm. If cooking without a pressure cooker, bring ingredients red lentils through salt to a boil in a large, heavy saucepan, reduce heat to low, and cover. Cook until lentils are soft, stirring often and adding water if they start to get too dry. 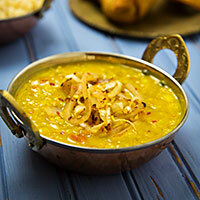 Different types of dal take different amounts of time, so allow at least 30 minutes. Proceed with the final three steps. Made this today and it *is* very comparable to oil-fried tadka dal. Hi, I tried this. It’s really nice. I am looking for a dal recipe without using any spices. Totally plain Dal (with little bit of chilly, termaric & salt. nothing else). This is a great recipe and very easy. My wife always gets the tadka dal when we get Indian takeout, so I figured I should find a recipe and make it at home. Thanks! thanks, this recipe worked just like my mom cooks back home in India. 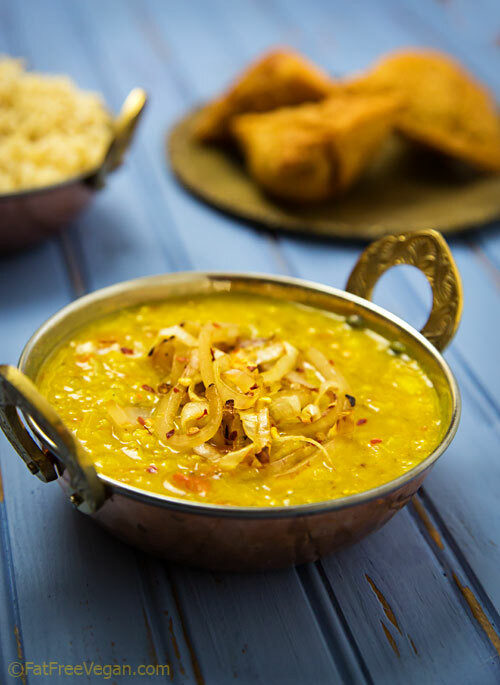 Just a variation to this recipe you could also add peanuts just after the dal is boiled. This was delicious! I had sworn off making Indian food because nothing ever turned out and there was always something missing, maybe depth of flavor. Not sure. Anyway I love your recipes and they always turn out great so I decided to try this and if it didnt work out I was never going to attempt Indian food again. It was easy and turned out really flavorful! I did sautée the spices in some water first and threw some kale in at the end because kale makes everything better. 😉 you are a cooking genius! Thank you for all of your great recipes! I’ve finally figured out to just come to your blog for recipes first instead of searching anywhere else. Thanks for the recipe, Susan. I made it my inaugural outing with my new Instant Pot (finally got over my jitters about using it), and it came out beautiful and delicious. Love the deep yellow of the turmeric and the combination of red lentils and yellow split peas. Another winner from your site! Thanks for wanting to share my recipes! I do have Pinterest in three places: at the top and bottom of each post and a button on the top left of each photo that Appears when you mouse over it. If you are looking at the mobile version, you may have to switch to the full version in order to see the share buttons. I have been eating this for breakfast (because it’s cooler in the morning) all week with a bit of steamed broccoli on the side. This is very tasty and satisfying, plus a breeze to make in the IP. Thanks for another great recipe! I have not liked lentils. I could never get the right texture. I had this soup at an Indian rest. and thought I would try to make it .It turned out perfectly and tastes exactly the same. Added a handful of chopped baby kale and it was delicious. Had to go out and get more lentils so I can make more tomorrow. Thanks for the great recipe !! Thanks for this yummy recipe. I have been making dal the traditional way for forty years but now I am teaching myself to cook without oil. I am amazed how throwing all the spices in the pressure cooker with the lentils works. I added kale and cabbage to the browned onions to make a complete meal with brown rice. Yum! Thanks for the recipe. I recently started making dals and I love your short cut of just tossing virtually everything in the pot. I doubled up on this recipe and it turned out perfectly. Btw, I used an Oshwawa pot inside the pressure cooker since when I’ve cooked lentils previously in the pressure cooker the foam would spew out of the cooker leaving a mess. My wife would be wiping up places my male eyes could not detect. Cooking this way increased the cooking time to 75 minutes. Thank you for the recipe! It was simple and quick in the Instant Pot! And so healthy, too! I made this and it was incredibly good. Thank you. thank you so much for Fat-Free Dal Tadka recipe giving such amazing and luscious recipies… I appriciate your write up. Just made and it came out delicious! So easy. Directions were great!! First time I’m trying one of your recipes and can’t wait to try more. This is constantly in my rotation as it is so delicious!! Rosalind and I recently returned from a trip to Sequim, Washington, we stayed over in Milwaukee, OR, and stopped at Bob’s Red Mill retail store. (We also took the very interesting tour of their packing plant.) I bought a 1-1/2 bag of Chana Dal, which as you know, are Split Desi Chickpeas. This recipe gives me the perfect opportunity to use the Dal. Thanks for the recipe. Made this on Sunday and added mushrooms and peppers (that needed eating) to the onions. It was sooo good. How many cups per one serving? It will vary but a serving size is around 3/4 cup. I am not a vegan, I found this recipe when searching for low calorie and lentils. I LOVE THIS and will definitely make it again. So easy in the pressure cooker and very tasty. Perfect for a cold Australian winter night. I’m inspired to try the other recipes from your website. This recipe is a definite winner. I made this last night but skipped the last step of onions on top just out of laziness. I also used a can of coconut milk and then water for the remaining cups of liquid. I’m not sure if this made it totally inauthentic but it was delicious! The house smelled amazing and my boyfriend loved it. It was so incredibly easy (and I did it stovetop). This will become a staple for us! I made this recipe tonight and we loved it! I didn’t make the onion topping out of time constraints and I added spinach after it was done cooking in the IP. My toddler at first looked at it and said, “I don’t want that.” I told her she had to try it, and so she did. She replied, “I like it!! !” and ate 2 bowls over brown rice. Thanks Susan! thank you for replying to the serving amount Susan! Thank you thank you thank you for doing these for those of us who’re trying to do WW. I was simply elated to read that YOU…have done it successfully. WOW!!! It gave me renewed hope…i was a colossal failure with Freestyle when it came out. They gave no indication, that the foods were to be measured…i went crazy…and gained a bunch. It’s been a long long time now…perhaps one day soon, i’ll give it another try. Measuring. tracking…no matter how “free” a food is, it STILL -MUST BE DONE eh? Thank you Susan…surely appreciate you!! This sounds amazing but I can’t get hold of an Instant Pot. Do you know how I could tweak the recipe for a slow cooker?